Stephen Varenhorst Architects, an architectural firm located in Philadelphia, Pennsylvania, sought to update their identity to better reflect their growing and diverse design practice which includes residential, commercial, and institutional projects. 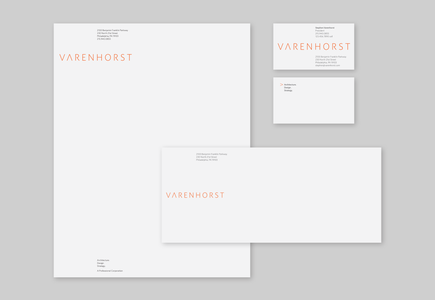 From a range of possible naming options, including the full name as well as its abbreviation, C&G Partners streamlined the identity to highlight only the founding principal’s last name, which was then carried through to the url—www.varenhorst.com. A modern, open spirit which exemplifies the firm’s approach to renovation and new construction inspired a clean, contemporary word mark that expresses those same qualities in graphic form. Restrained color and slim type further reinforce this same architectural approach. By removing the crossbar of the “A”, the letterform becomes an arrow that introduces a spatial dimension and distinctiveness to the identity as it appears in both print and digital applications.